The trend hunter strategy is a faster pace strategy than a dialy strategy and is a great strategy if you are looking for a mechanical way to enter the market. This strategy allows you to combine this method with any other method of finding a bias or a market direction. Once you have your chosen direction, the 15 minute trend-hunter strategy provides you with a pin-point accurate entry that will also give you signals to quickly dump the trade if the market conditions change. 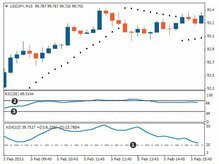 This strategy makes use of the parabolic SAR, RSI and ADX indicator and is great for those that wish to trade on smaller time frames and take multiple trades throughout the day. Providing the market direction remains the same, the trend hunter strategy will get you right back into trades quickly so you don't close down and then miss the move. Learn how to use a gap trading strategy (with variations) to help find potential trading opportunities.